Pork tenderloin is my favorite cut of meat from the pig — it’s lean, tender and easy to work with. I often substitute if in recipes that call for pork loin (and even pork shoulder, which to me is so slimy, it’s kind of gross and hard to deal with). Tonight I used pork tenderloin to make this “medallion” recipe, where the meat is the star, but the delicious sauce gets 5 stars! 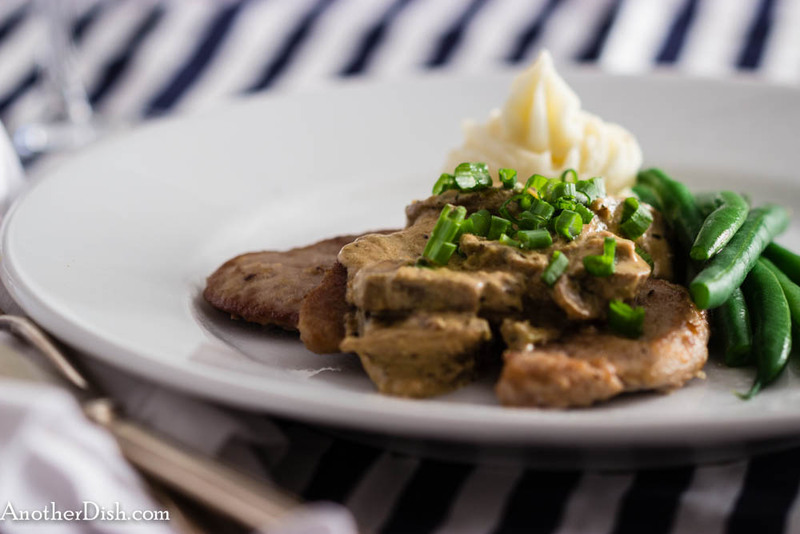 This dish goes perfectly well with mashed potatoes and green beans — give it a try next time you’re in the mood for pork and let me know what you think! Heat 1 Tbsp butter and 1 Tbsp olive oil in a large pan over medium-high heat. Once foam from butter subsides, stir in mushrooms. Sauté until mushrooms are lightly browned, about 7 minutes. Remove pan from heat. Remove mushrooms from pan and set aside. Combine flour, 1/2 tsp salt and 1/4 tsp ground black pepper in a large, shallow dish. Meanwhile, heat 1 Tbsp butter and 1 tsp olive oil over medium-high heat in pan used for the mushrooms. Dredge each piece of the pork in the flour mixture and place into the pan in a single layer (I used a very large pan and was able to accommodate all pork at once — you can do a couple of batches, if necessary). Cook pork until heated through, about 2 minutes per side. Remove pork from pan — cover with foil and keep warm in an oven. Add white parts of the green onions to the pan. Sauté 1 minute. Stir in white wine and bring to a boil. Deglaze pan as wine boils for 2 minutes. Stir in the stock, 1/2 tsp salt, 1/4 ground black pepper, 1/2 tsp thyme and the sour cream. Bring back to a boil, then reduce heat to medium. Let sauce simmer until thickened, about 5 minutes. Whisk in Dijon mustard, then remove from heat. Season with additional salt and pepper, if desired. Spoon sauce over pork and garnish with the green parts of the green onions. Serve. This entry was posted in Main Dishes, Pork and tagged Comfort Food, Cooking, Food, Food Photography, Foodie, Recipes on March 22, 2015 by AnotherDish. Thanks for the comment about the profile pic, and I agree, mustard (but not too much) is nice in a sauce. One of my favorite dishes is “Eggs in a Mustard Sauce.” It’s a German dish, and it’s delicious! Look for it.